Dear Emily Goodwin, I love you!!!! Here it is you guys. 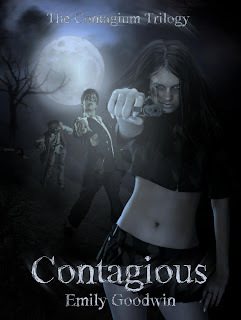 The NEW Contagious cover!!!!! Ms. Emily Goodwin posted it on Facebook yesterday. I admit at first glance I was like this is cool….but something seems off. Kami and I talked about it and we decided that Orissa would never wear that outift this close to zombies! Also, she doesn’t gangster hold her guns. The more I look at it though the more it grows on me. I see the bigger picture here. Of course I don’t see the perfect Orissa here because I HAVE READ THE BOOKS. These new covers, however, are to bring in NEW READERS. What people browsing the thousands of books on amazon will see is a hot babe who kills zombies and for .99 cents. YESSS!!! Sure score. When they read the book they will learn to know and love Orissa and gang like we do. But if they DON’T PICK UP THE BOOK…they will never have the chance. Kami turned me on to Contagious a few months back. I fell in love with Emily’s writing. (But mostly it was Hayden). LOL–we have established I am shallow. Yes? Hmm. Like the rabid fan girl I am I added Emily to my friends list on goodreads, stalked her on fb and found her blog. When I discovered her blog I saw that she was looking for betas for DC. Score!! I wrote my email and sent it off immediately. No way was I gonna miss my chance. Thanks to Emily’s husband I got chosen!!! Yay!!! I absolutely loved beta reading DC. I got to get a sneek peek and interact with one of the nicest, down to earth author ladies. EVER! Last month Emily contacted me on Facebook to look at a cover she was considering for this series. I’m going to be honest and say it was less than stellar. I liked the concept but it just wasn’t *doing it* for me. (Trust me guys this cover is leaps and bounds more professional and awesome looking). I know part of the struggle that Emily went through. I directed her to a famous cover artist who does amazing work. They wanted 3 Grand for the series. LOL. That is out of most peoples price range. Then I got in touch with a local friend. He said he would look at it. But then kinda blew it off. He has two jobs and is a busy guy. I felt bad but that’s all I could think of. Luckily Emily found this artist. I am so happy for her that she found someone!!! I am so happy that she got a professional cover that screams HOT BABE KILLS ZOMBIES!!! Which be honest…is what Orissa is. Emily has been nothing but awesome and supportive of me and this blog. From the beginning she has sent readers to this blog and my facebook page. She has answered everyone of my emails and facebook messages. I love that I can count her in my amazingwriterfriends list. I will do everything in my power to support her…because she deserves it. She works hard for us fans. She appreciates us. Trust me she does. Thank you Emily!